November 24, 1924. Washington, D.C. "Bonus Bureau, Computing Division. Many clerks figure the amount of the bonus each veteran is entitled to." View full size. Submitted by Joyce on Thu, 01/22/2009 - 1:27pm. Need I remind anyone that all of these guys and dolls were employed. 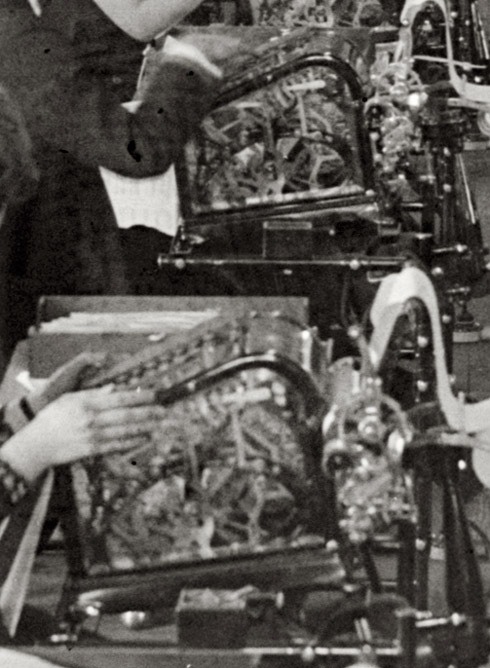 With the advent of modern technology many stenos, typists and other office machine operators lost their jobs. Your salary is probably even done by direct deposit to your bank. I love machines -- obviously, I'm using one now -- but they have a higher failure rate than I ever did. Have lived in interesting times. Submitted by Ramon on Thu, 01/22/2009 - 12:33pm. Submitted by Duane1947 on Wed, 08/27/2008 - 3:50pm. In response to Aching Back, My mother was working in a Massachusetts factory accounting department about 10 years after this photo. She said that a 5 and 1/2 day work week was the norm for that job in the mid-thirties. Submitted by Anonymous Tipster on Wed, 08/27/2008 - 10:58am. While it is fun to OD on all the vintage technology in this photo, I can't help but think how miserable I would be if I had to sit there all day doing the "computing". I wonder if they had five or six day work weeks? My back aches just picturing myself getting out of the chair at the end of the work day. Submitted by Anonymouse on Wed, 08/27/2008 - 10:36am. Obviously windows users, nary an apple in sight. An arguement could be made for open source, too. Submitted by Jorge Curioso on Wed, 08/27/2008 - 10:31am. Except with lots of well-dressed young ladies. I think I prefer this! Submitted by Anonymous Tipster on Wed, 08/27/2008 - 9:57am. In 1969 I had a summer job for Aetna Insurance in San Francisco (a job I hated). In calculating insurance for plate glass I used one of these machines. They were amazingly noisy, especially when dividing when you pushed the carriage to one side, plugged in your numbers, and let it run clackety clackety for about two minutes, when it would spit out your solution. It was just a few years later when you could buy a tiny battery run calculator. Submitted by Anonymous Tipster on Wed, 08/27/2008 - 9:02am. The bonus this diligent staff is calculating was for veterans of WWI. However, the money was not to be paid until 1945. With the onslaught of the hardships of the Great Depression, the veterans wanted their money sooner than later. In the spring of 1932 thousands of these veterans formed what was called a “Bonus Army” and marched on Washington demanding early payment. Congress refused and an Army contingent led by General Douglas MacArthur, and Majors Dwight Eisenhower and George Patton was ordered to forcefully remove the veterans from their encampments in the city. Submitted by stanton_square on Wed, 08/27/2008 - 8:34am. A stunning array of milliflops of raw computing power! 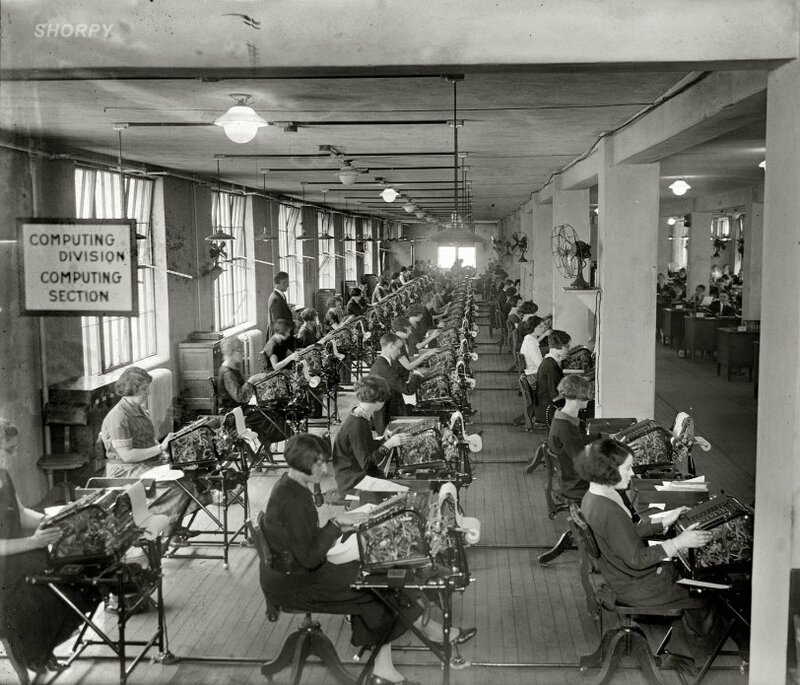 This photo reminds me of the Richardson "Forecast Factory": a 1920s vision, never realized, to accomplish numerical weather prediction by assembling a grand hall of thousands of human tabulators under the direction of a central conductor. Submitted by Anonymous Tipster on Wed, 08/27/2008 - 8:05am. Judging by the caption, this must have been temporary. Submitted by Dave on Wed, 08/27/2008 - 1:51am. Circa 1911 Burroughs Typewriter Adding Machine. More at the Early Office Museum. And at OfficeMuseum.com. These complex devices were electromechanical, as opposed to electronic. Some used punch cards. Submitted by Anonymous Tipster on Wed, 08/27/2008 - 1:14am. 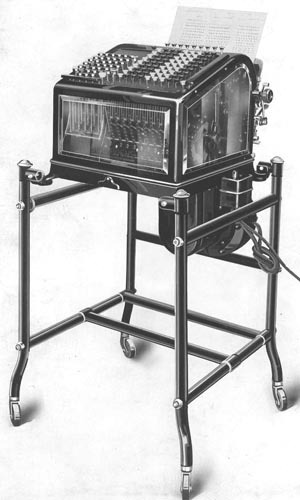 So who can tell us about these motorized mechanical tabulators? Interesting to note that the sides are glass. Easier to see what needs fixing. Submitted by Miguel Chavez on Tue, 08/26/2008 - 9:22pm. There are many interesting things in this photo. First of all, what caught my attention was the lighting fixtures overhead. It looks like the whole lighting circuit had been built hastily in a previously existing room; exposed metallic tubes holding the electric cables would have been embedded in the concrete slab of the roof if the installation had been designed at the same time as the building. Another interesting thing: those tabulating machines. They are old antecedents of today's spreadsheets, and it's interesting to see that, even in this early date, those machines were already electrical. Evidently they didn't have much electronics inside - the machines must work using electromagnets and mechanical parts, but must have been able to perform basic mathematical calculations in a more precise and faster fashion than by hand. Again, the electrical circuit used to power the machines was built over an existing floor; another evidence that this room was originally intended for other use and was adapted to this task. No air conditioning; just a few electric fans scattered here and there in the room. But there are several hot-water or steam radiators near the walls, so the building was originally equipped with central heating. Must have been a very uncomfortable place to work by the end of the day; too hot and noisy and crowded. These pics are excellent references to how life was like before our modern world, before all the things we now take for granted were even conceived. Thanks for sharing them, this site is definitely a very valuable resource for people interested in history like me. Submitted by Mr Mel on Tue, 08/26/2008 - 9:20pm. The noise must have been deafening. Submitted by SysAdmin on Tue, 08/26/2008 - 8:09pm. Submitted by Anonymous Tipster on Tue, 08/26/2008 - 7:15pm. Wow. Even back then the processors had cooling fans.